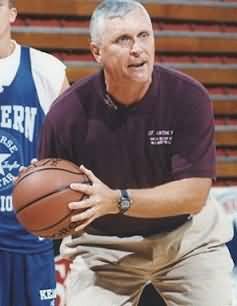 Coach Bob Hurley has used this press break, which he calls "Flood", for attacking the 1-2-1-1 , or 1-2-2, full-court press defense. This works well against teams that pressure and deny your guards the inbounds pass, or aggressively trap the first pass. Diagram A. 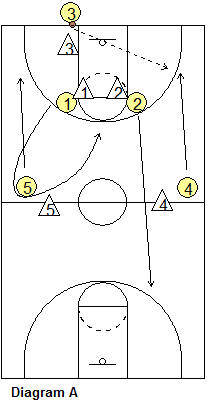 The guards O1 and O2 start at the elbows, and post players O4 and O5 start at half-court, wide. Coach Hurley does not want a short inbounds pass vs the 1-2-1-1, as this can be easily trapped. 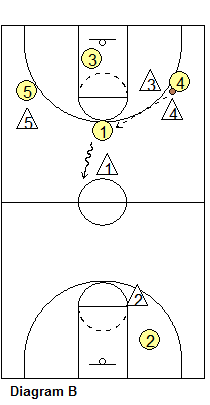 Instead, both O1 and O2 turn and sprint wide and deep, with O2 sprinting all the way to the basket. O3 could make the long pass to O2 going deep, but mainly O2 breaking long will occupy one defender and force X2 deep, taking him/her out of the press. 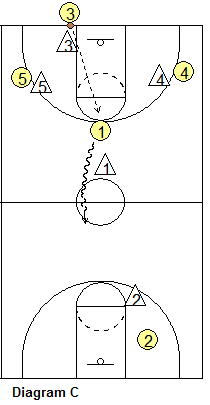 O1 sprints up the right sideline, but upon reaching half-court, will turn and sprint back to the ball, to the middle near the arc. Meanwhile, O4 and O5 sprint up from their half-court spots for the inbounds pass from O3. It's very important that both O4 and O5 sprint to the 3-point arc area, and not the elbows, for good spacing. After receiving the inbounds pass, O4 (or O5) passes to our point-guard O1 in the middle (diagram B), and usually O1 can speed-dribble up the court and break the press from here. Sometimes O1 will be open for the inbounds pass from O3 (diagram C), if O4 and O5 are not open, but O1 really has to cut hard and fast to get to that spot in the middle. After making the inbounds pass, O3 should stay below the ball for a safety pass back if O1 is not open for the pass (diagram B). O4 and O5 sprint to the arcs (not the elbows or paint). O2 sprints all the way to the hoop. O1 sprints hard and cuts back hard to get the pass. The point guard O1 should have the dribbling skills to beat his defender 1-on-1 in the open court. O3 stays behind the ball for the safety pass back. with Mike Krzyzewski "Coach K", Duke University Head Men's Basketball Coach, Naismith Memorial Basketball Hall of Fame.